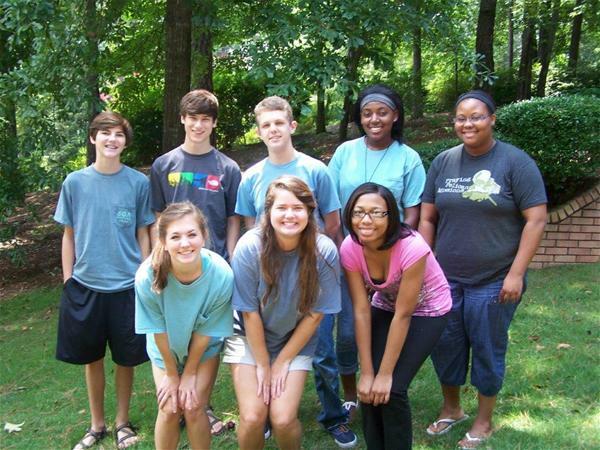 What is the Hoover Recreation Teen Board? The Hoover Teen Recreation Board is a division of the City of Hoover Parks and Recreation Department. The board hosts special events throughout the year for teens by teens. It is comprised of 10 - 15 students attending Hoover and Spain Park high schools. A chairman, co-chairman and secretary are appointed to lead meetings, to manage special events and to motivate the members of the board. Each member of the board serves on sub-committees and has specific responsibilities that they oversee while serving on this board. The Hoover Recreation Teen Board aims to provide an outlet for Hoover teens in hopes of paving the way for a more positive unified community. The Teen Board hosts a variety of special events for Hoover’s teens each year and is committed to provide a safe, healthy, and fun atmosphere for individuals attending events. Back row left to right: Wes Fulmer, Matthew Russell, Michael Barrett, Jessica Robinson, Acqueline Cain, front row left to right: Caroline Cole, Skyler Kennamer, Nadia Armbrester, not pictured: Madison Wilson, Haley Hill. No events at this time. Please check back with us!